Ocean acidification is a global carbon dioxide (CO2) issue, but as we work to reduce global emissions and factor oceans into the global climate change discussion, we must also focus on reducing the local sources of carbon in the water. Local sources of carbon dioxide, such as runoff which cause algal blooms that tend to increase CO2 in the water over time, do not cause ocean acidification, but can make a bad day worse. This is especially true in coastal waters, like bays and estuaries. Because of the simultaneous and varied pathways to pursue to better understand and combat ocean acidification, OPC is taking action in the state, across the region, and internationally, and our work on ocean acidification cuts across many of our other initiatives. OPC’s Ocean Acidification and Hypoxia program seeks to protect ecological and coastal communities from changing ocean conditions by improving understanding of how a changing climate will alter California’s ocean and coastal ecosystems, identifying opportunities for actions, increasing public awareness, and building sustained support for this problem. 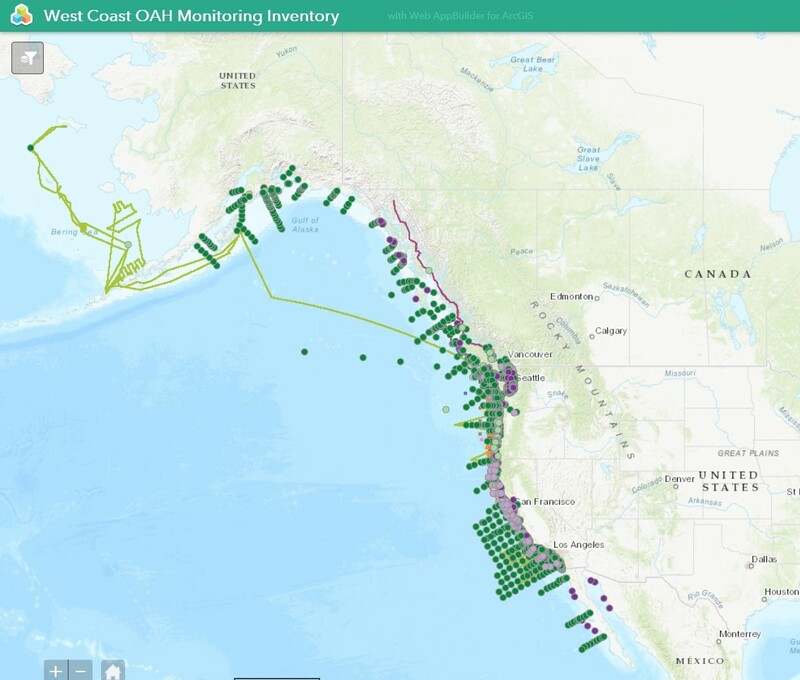 MONITORING CHANGE OPC works with scientists and monitoring practitioners to ensure California is comprehensively tracking changes in physical and chemical ocean conditions, as well as impacts to biological, economical and cultural resources. 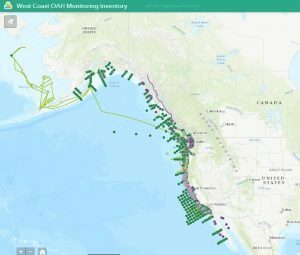 OPC is working with additional members of the Integrated OAH Monitoring Task Force in California, Oregon, Washington, British Columbia, and Alaska, to build a comprehensive inventory of West Coast monitoring of chemical, physical and biological parameters that inform our understanding of long-term oceanic change. The inventory identifies not only where, but also how we are monitoring ocean acidification and its impacts, to assess whether current monitoring infrastructure meets management needs, or whether there are critical gaps to fill. The Task Force was founded by the Pacific Coast Collaborative Subcommittee on Ocean Acidification in collaboration with the federal Interagency Working Group on Ocean Acidification (IWG-OA). ADVANCING SCIENCE OPC works to advance and translate latest science into coastal and ocean management decisions. In 2012, OPC charged the OPC Science Advisory Team (OPC-SAT), under the leadership of the California Ocean Science Trust (OST), with convening a high-level ocean acidification and hypoxia science panel to provide decision makers with the knowledge needed to thoughtfully evaluate effective management actions. 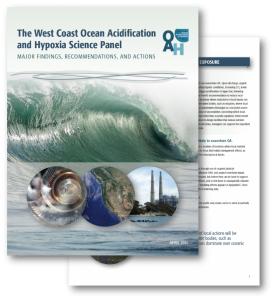 Recognizing the west coast-wide nature of the potential impacts, the West Coast Ocean Acidification and Hypoxia Science Panel was composed of leading scientists from California, Oregon, Washington and British Columbia. In 2016, the Panel released a body of products that synthesize the state of knowledge and identify science-based options to manage OAH impacts at the regional and local levels. In response to Assembly Bill 2139, Williams, the Ocean Protection Council is developing an Ocean Acidification and Hypoxia Science Task Force to ensure that decisionmaking and further action on the issues of OAH continue to be supported by the best available science. The Task Force is composed of Ocean Protection Council Science Advisory Team (OPC-SAT) members and additional experts, and will serve as a responsive advisory body that will provide scientific guidance to the OPC in an ongoing manner to inform continued actions on ocean acidification and hypoxia in California and along the West Coast. 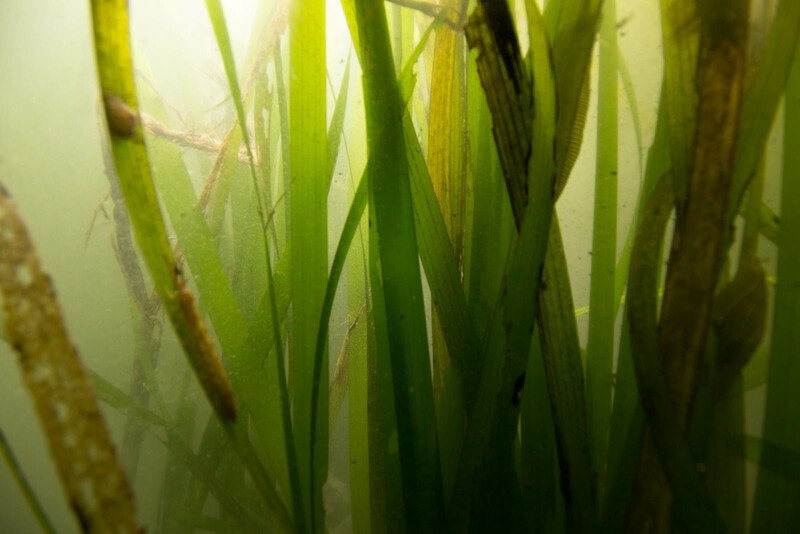 DEVELOPING ADAPTATION STRATEGIES OPC is working to improve understanding of the impacts of ocean acidification on coastal and ocean ecosystems and is exploring several adaptation strategies to minimize adverse effects. From 2016 – 2017, the California Ocean Science Trust (OST) convened a working group of the Ocean Protection Council Science Advisory Team (OPC-SAT) to inform the State on how best to implement the recommendations from the West Coast Ocean Acidification and Hypoxia Panel to advance approaches that remove carbon dioxide from seawater, including through the conservation and restoration of seagrass and kelp beds. 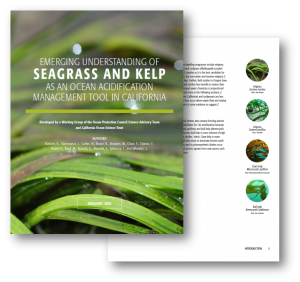 The working group produced a final report to the Ocean Protection Council on guidance that can inform next steps for California as it leverages existing monitoring assets and prioritizes new investments to where and how to protect and restore submerged aquatic vegetation (SAV) as an acidification management strategy. SOUND POLICY GUIDANCE OPC informs, shape, and implements sound policy to support swift response. 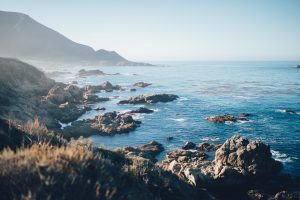 The State of California is now undertaking development of an Ocean Acidification Action Plan under the leadership of the California Ocean Protection Council and in cooperation with the California Ocean Science Trust. This policy and management action plan will be one of the first of its kind, and is being developed within the framework of the International Alliance to Combat Ocean Acidification (OA Alliance), a global partnership founded in 2016 to assist governments in taking meaningful action to anticipate, mitigate, and adapt to the significant changes to the chemistry of the world’s oceans that are now occurring as a result of carbon dioxide (CO2) emissions. Assembly Bill 2139 (Williams): Directs the OPC to coordinate agency action across the full suite of the Panel’s Recommendations, and establish an OAH science task force. The bill specifically directs OPC to adopt recommendations for further actions to address OAH at its first meeting of the year beginning January 2018, and annually thereafter. 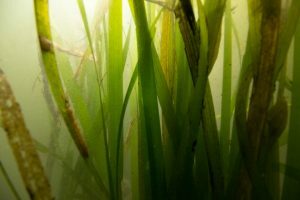 Senate Bill 1363 (Monning): Directs the OPC to implement an OAH reduction program to support conservation and restoration of seagrass habitats to ameliorate OA, buffer carbon, as well as the many ecosystem benefits they provide. PARTNERSHIP ENGAGEMENT OPC coordinates closely with partners at the local, regional, national and international level. OPC will continue to expand these partnerships to raise awareness and build sustained support. In 2008, the Governors of California, Oregon, Washington and the Premier of British Columbia signed the Pacific Coast Collaborative Agreement, creating the Pacific Coast Collaborative (PCC). Since its inception, climate change, clean energy and ocean acidification have been high priorities for the PCC. In its 2016 Climate Leadership Action Plan, the PCC agreed to increase awareness, understanding, and action on ocean acidification and other climate-related changes in ocean conditions. Created by the Pacific Coast Collaborative, the International Alliance to Combat Ocean Acidification aims to raise awareness, and support the development of OA action plans worldwide. Governments at all jurisdictions, independent organizations, universities and research institutions to name a few are all encouraged to join at https://www.oaalliance.org/. The Interagency Working Group on Ocean Acidification (IWG-OA) was chartered in 2009 by the Subcommittee on Ocean Science and Technology, as directed by the Federal Ocean Acidification Research and Monitoring Act of 2009 (FOARAM Act). 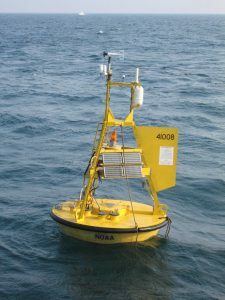 Chaired by NOAA and Co-chaired by the National Science Foundation (NSF) and NASA, the IWG-OA has representation from 13 agencies and frequently engages with regional partners to promote informed investment in basic, multi-disciplinary, and applied ocean acidification research and long-term monitoring. The Pacific Coast Collaborative (PCC) and the Interagency Working Group on Ocean Acidification (IWG-OA) have partnered to convene an Integrated Ocean Acidification and Hypoxia (OAH) Monitoring Task Force (Task Force), which staff from the Ocean Protection Council help lead as representatives of California.